Amy’s family is the fastest in the world, and it will take one of the slowest creatures on the planet to calm their hurried lifestyle; which is exactly what happens when Amy discovers a sloth in the park. Amy brings Sloth home, where her parents quickly try to teach him how to fit in. They rush Sloth to wash faster, eat faster, MOVE faster, but to no avail; because, it is up to Sloth to provide the most valuable lesson—patience. To’s vivacious illustrations, though bursting with energy, are key to communicating the story’s important theme of slowing down. 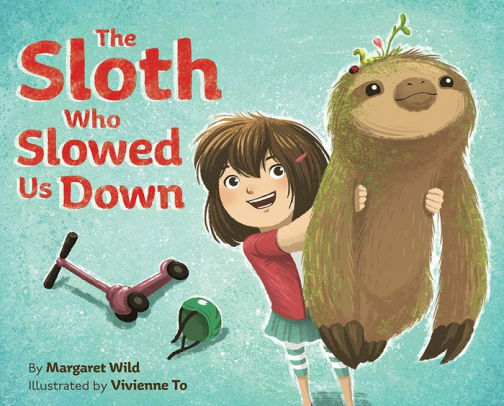 To provides hints to the changing story with each passing page—books titled “Think Faster” and “A Guide for Busy People” are replaced with “Art of Patience;” a multi-tasking mealtime scene transitions to a relaxing picnic lunch; and, most importantly, the final illustration includes a winking sloth who has moved in with “the new speediest family in the world.” Readers will enjoy the tender tale which illustrates how a touch of slothfulness may be just the thing for busy families who need to slow down and enjoy an endearing story time together.